For almost a week now, there have been talks of a large scale Godzilla off-site event taking place during San Diego Comic-Con, with fans wondering what exactly will happen at this event. Well, now we have a good idea what sort of presence Godzilla will have at SDCC this year. 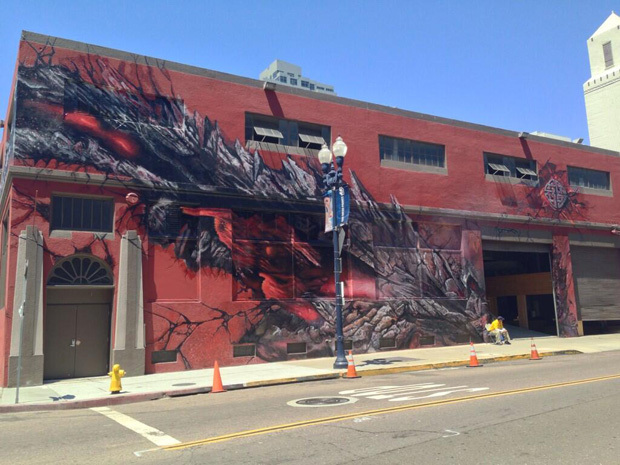 Just hours after a Godzilla panel was announced for Hall H, work on a large mural began to take place on an empty warehouse-like building just half a mile from the convention center. The mural depicts some major battle damage to the building by fire. Also seen on the building is the Legendary Pictures Logo, also battle damaged making it a dead giveaway. While it’s uncertain what exactly will be inside this building, it’s obvious that Godzilla’s new design will be revealed in a big way. Just last week, twitter was abuzz about an effect rumored to take place in the bay behind the convention center through a large-scale water projection effect where Godzilla would be seen rising out of the Pacific Ocean. While that effect is not confirmed and likely wont happen, just thinking about it gives us the nerd-willies and we cannot wait to see inside the large warehouse. Previous PostStar Trek Enterprise-D Bridge and Sci-Fi Museum Coming to SDCC 2013 Next PostTropical Storm Chantal heads to Florida-How will it affect your theme park vacation? New poster and trailer for Godzilla Resurgence emerges! Skull Island film moves from Universal to Warner Brothers for a Godzilla death match, could a theme park attraction also happen?